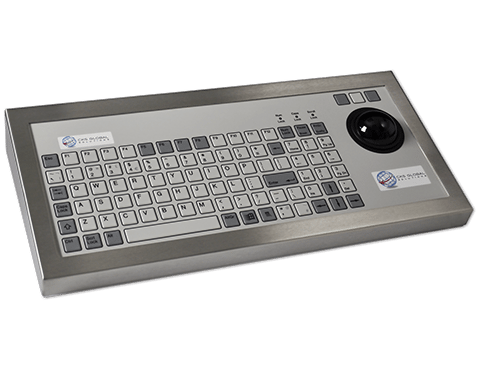 The 96T series keyboard has been designed to offer a compact footprint size, whilst retaining all the standard features of the 101/102 PC keyboard as well as an integral 50mm (2”) tracker ball. Language and connection variants make this a versatile and easily customisable product. A dual interface, when using PS2, allows engineering override if required. Ideal for tough applications and suitable for wash down areas. Automating industrial processes may be the solution fast-paced industries need to compete on a global scale. 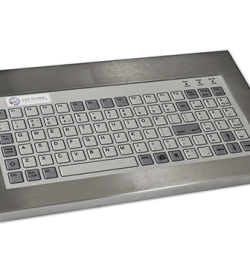 In fact, food processing, aviation, and distribution industries are now optimising their operations by integrating rugged industrial keyboards. 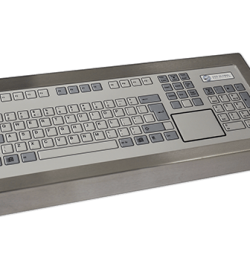 Integrating these keyboards to our industrial-grade computers can fully optimise operations. 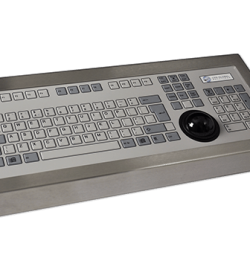 Amongst the most recommended of our peripherals is the 96-key industrial keyboard with trackerball. Its 304 stainless steel construction and ruggedised interior ensure its functionality despite continued working operations. 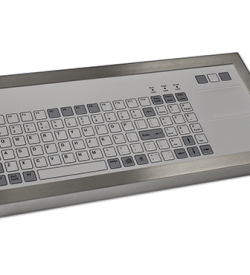 Our industrial keyboard features sealed mechanical keys. This gives each button it a life expectancy of 1 million switch cycles. Its stainless-steel casing and NEMA 4 sealing protect its components from dirt, water, and liquid chemicals. Furthermore, its ruggedised build ensures that the peripheral device can operate in temperatures between -20°C to +60°C. Therefore, an operator can rest assured that this device functions whenever needed. 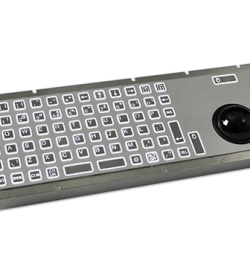 Our 96-key industrial keyboard comes with a reliable trackball. It has an expected ball revolution cycle which can reach as high as 6 million. Its integrated design is ideal for industries which have operations with limited physical space. Moreover, its 200 pulses/ ball revolutions make it one of the most accurate embedded pointing devices. We understand that specific processes require uniform device specifications. So, we offer customisable trackerball colour options for our 96T series keyboards. Some operations which can often include environments with high relative humidity. However, our 96T series keyboard remains functional despite these conditions. Its high IP65K rating and bezel mounted casing prevent water from seeping into the peripheral. As a result, it remains operable despite exposure to moisture environments such as frozen food processing plants. 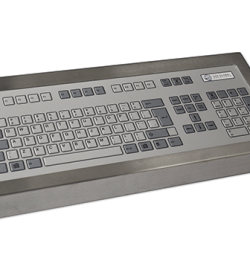 For over 30 years, we have built reliable industrial computing devices for our client’s industry. We can work with you to create the 96-key industrial keyboard with trackerball fit for your industry. So, download a FREE datasheet from us or contact our representative through the number (+44) 01438 747111 today.